Prayer is a mighty weapon in the arsenal of the Saints of God. We are commanded to pray in Luke 18:1b. “Men ought always to pray, and not to faint.” Through prayer, we communicate with God. Through our consistent communication with Him, we build relationship. It is through our relationship with Him that we are strengthened day by day. When we face life’s adversities, our relationship with God is our strength. To live victoriously we cannot depend solely on what we see, for many times what we see is a deception. A fraud, designed to weaken our faith. To be victorious we have to see the situation according to the Word of God. 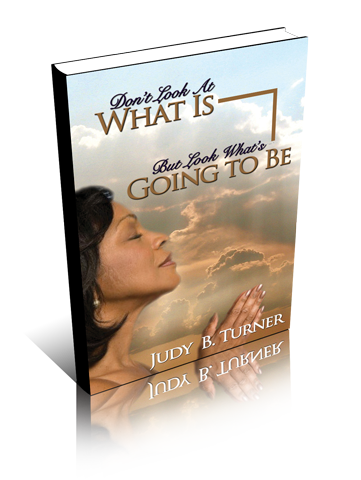 The spirit of Jesus Christ “breathed” on Judy, which gave birth to this book. She is extremely convinced through Jesus Christ and HIS spirit; that this book will be a blessing to all who read it. Throughout the pages of Don’t At Look What Is, But Look What’s Going To Be, she shares numerous incidents about seeing your way through with prayer.